Boyhood memories of packet boat days on the James River were recalled yesterday, along with early recollections of Lynchburg, by W. E. Jordan, 81, of 304 Oakridge Blvd., who came from Richmond to Lynchburg aboard the historic Marshall in 1876. Although but four years old at the time, he remembers the family’s journey, their immediate departure for nearby Long Island, and their return three years later to make their home on Daniel’s Hill, Lynchburg. His father, J. W. Jordan, first was a farm manager, and then became associated with the John P. Pettyjohn Construction Company and later with the Glamorgan Foundry. The Marshall already had attained fame when the family came to Lynchburg by way of the river and canal, and the memories of that trip probably were impressed by that fact and also by later associations with the old boat, when it lay along the bank of James River. It was aboard the Marshall that the body of Stonewall Jackson was conveyed May 13, 1863, to Lexington for burial. A remnant of the Marshall, suitably marked, has been mounted in Riverside Park, a metal piece rescued when the boat was all but gone. 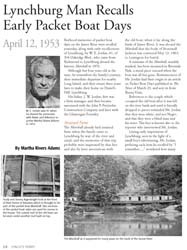 Reminiscences of Mr. Jordan had their origin in an article on Packet Boat Days published in The News of March 29, and sent in from Buena Vista.